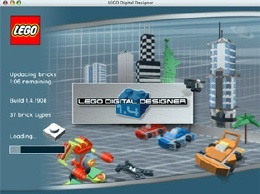 Lego Digital, Taking Their Business Online | OhGizmo! For whatever strange reason, I was never a Lego dude. I’m in the right demographic and everything, yet they never took hold. Go figure. That’s not to say there aren’t legions of people in their 20s (and a bunch of other age slices too, of course) that still feel somewhat neurotic at the mention of that word. The Lego folks must be aware of this as they’re now (or not now, I’ve no idea how long this has been around) releasing what could possibly become their most successful product to date. It’s called Lego Digital. The premise is simple. Go online, build any 3D shape you want. Make it look like your conjoined twin if you like. Then, when you’re good and satisfied, send them some money and they will ship to you the parts necessary to build your creation. Check it out here. Story VIA Core77. I was messing around with this last week. I ran into the problem of them limiting the number of a certain kind of block you can use. Unless I missed something but it was hella annoying.